This announcement is significant news in that it tells people in China that wild tigers are important. The fact that President Xi Jinping recently asked about the needs and habits of wild tigers is even more encouraging. News of this new office is less significant when viewed in a fuller context. China’s State Forestry Administration (SFA) has for many years talked about its support for saving wild tigers and stopping illegal tiger trade. What SFA officials did not say—and still do not say—is that they were and are investing significantly more effort and money in growing China’s tiger farming industry, upping its capacity to brew tiger-bone wine and seeking international approval for reopening legal trade in luxury products made from farmed tigers. The SFA’s Wan Ziming wrote in a 2009 magazine article that China would be prepared to appeal all the way to the International Court of Justice in The Hague should the UN treaty on international trade in endangered species—CITES—not give its blessing. Forgive me for repeating myself: the problem with tiger farming is that it stimulates demand for tiger products, which, in turn, stimulates poaching of wild tigers because consumers consider products from wild tigers superior in quality, far more prestigious and exponentially more valuable. 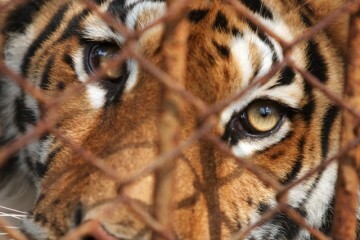 Some investors are even buying products made from wild tigers as they would rare art or gold. As long as China allows some 6,000 tigers on farms with tiger-bone wine brewing in their wineries, it will continue to stimulate demand for and poaching of wild tigers. The commercial force of that demand will trump any benefits that could possibly come from a single government office with a mandate to protect wild tigers. In fact, some observers might find it a bit cynical for China to open such an office while it continues to farm tigers at an industrial scale. Debbie’s point is the bottom line. Until China does all it can to protect wild tigers and, more importantly, to stop consumer demand for tiger parts and products from all sources, little if anything will improve for wild tigers. As the WildAid slogan so aptly says, “When the buying stops, the killing can too.” And only then. Next post: Does China’s president know the truth about tigers and rhinos?